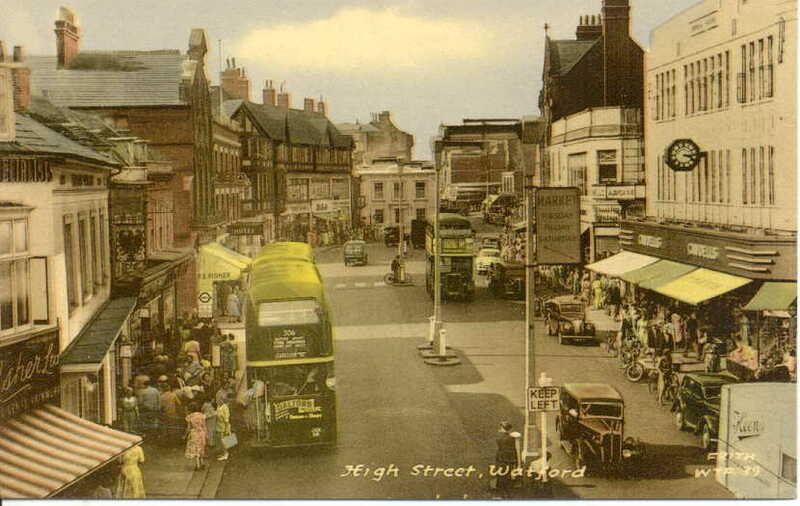 Watford Museum, Frith Series Postcard. I was born in King Street maternity hospital in 1950 and have fond memories of Watford n the 50s and 60s. I remember draughty Watford market, and in particular the fish stall which stood on a really cold corner. Mum would buy winkles, muscles, cockles or shrimps and we would take them home for Saturday night tea. And of course, we couldn’t leave the market without our Gibsons sausages! I remember Cawdells too, which seemed like a somewhat poor relation of Clements then. In those days British Home Stores used to sell wonderful cheese from their food counter near the front of the shop and Marks and Spencer had assistants behind every counter. Can anybody remember the name of the bakery opposite Fine Fair at the then ‘posh’ top end of the town? I used to work opposite in shop in an insurance office. The first time I went into Top Rank (fibbing about my age) I was absolutely gobsmacked how luxurious it was – and that was only the ladies powder room (honest). We had never seen anything like it because up till then the only dances we had been to had been in somewhat grotty halls – the Trade, Kingham Hall, Hillside, Woodside etc. But they were great nights out with real bands, something we lost with the advent of discos. I was a mod in the sixties and every Saturday (via the 318 or 347 bus) it was important to get the very latest clothes (seen on Ready Steady Go the night before), to go out in. Martin Fords was my favourite, as it was the only shop I could afford to buy clothes in! Then of course, you had to stand about in the High Street, trying to look cool but hoping desperately everybody was looking at you! Once your boyfriend had a car, it was off to Old Redding for a snog and steamy windows! I think the rot set in when they knocked down the Park Gates, it was like a disease really, they just kept pulling things down until they had ripped out any semblance of character in Watford, now most of the shops are the same as can be seen in any other town, except good old Jacksons the jewellers. Happy days. Men) also Zoot Money Band and Micky Finn and Blue Men. The main Watford act was Cops and Robbers. Ronnie Wood played there too in The Birds. Kingham Hall even featured Hawkwind with Stacia dancing. sometime in the early sixties at the Trade, The Animals and Sonny Boy Williamson? Living in Oz now but grew up in Rickmansworth. I have great memories and one or two a little haxy but I saw Johnny Winter, Free and Emmerson Lake a Palmer at the town hall and just about every other week we would catch Genisis, Caravan, Atomic Rooster, Alex Harvey Band a really brilliant time for live music. The bakery opperset fine fare was the Chef patisserie. Born in watford lived in Ricky. Went to top rank and worked at John Morley jewellers in the mid 60’s. Loved watford. Live now in Canada since 64 and have visited watford twice since leaving but not for many years. I remember all the places and bands from around 1964 up the slow sad death of them al once Top Rank opened. One venue not mention was “Walk Of The Mods” that had a shortish run on a Monday in an upstairs room at the Hertfordshire Arms. I don’t recall any major names just good blues bands not in the mainstream. The Trade had two nights I attended one had a green membership card the “20+1” I think and blue card on a Sunday. There were odd Monday gigs by bigger names I remember The Hollies and The Yardbirds. Some amazing nights with The Action, Mark Four, Sony Chile and TNT, Malcolm McGowan, Graham Bond later near the end of the Trade The Skatterlites. Great times glad I was young then, long live live music! This article really took me back to my youth. I remember and visited all the clubs mentioned. I used to love Friday and Saturday nights at the Trade, Tuesday at Top Rank Wednesday at Woodside, then there was Hillside and Kingham, the list seemed endless and we were so lucky to have all those top bands to see – doesn’t happen now! I left Watford in the 70’s but my parents still lived in Abbots so I visited quite often till ten years ago but it was never the same. Great to look back on the memories though. Watford a great place in the 60’s…The Trade, The Rank, The Clockhouse. Out of all the great bands I saw and I saw most…the Joyce Bond Set always springs to mind. Saw her once only at the Trade and they were fantastic. Also liked The Alan Bown set. They never seemed to quite get there but were brilliant live…Bown was a real showman with his trumpet and dancing. These were replaced by the New Penny & The Pickwick but were never quite the same ! Great chicks around in those days too…wished I’d gotten to know more of ’em ! Live in Western Australia now and have done for over 40 years ! Been back but its changed and is the poorer for it unfortunately ! I came from Carpenders Park and would love to hear from anyone from that era.